Tried a new and fun way to proof stimulus control today. I love all the fun things you can do with sending the dog around a pole. The idea here is that the dog has to listen more carefully as she can’t read my body language when I’m walking away from her. If your dog isn’t used to running around the pole, you can throw a treat on the ground and walk away to create distance from the dog. A helper to tell you when the dog is correct is also a good idea. Some more obedience training with Squid today, along with Thomas and Louise (with Squid’s little sister Kite). We worked some more on send to square, and I’m pleased with our progress. I’ve almost exclusively rewarded stop in the square for the past weeks, and that has led her to stop early (especially when the distance is long). This was something that I expected, and I decided to ler her work through it instead of going back to reward for running through the square. I’ve just waited her out when she stops early, and only rewarded when she’s gone all the way to the middle of the square. I was happy to see that she found her way to the middle nicely todat, even when I moved the square past the earlier point of reward and close to the wall. For the first repetitions, I hid Thomas behind the wall and had him throw the toy over the wall to reward her when I clicked. It’s fun to be able to reward with good precision and timing without the dog knowing that the reward is there before the click. When I look at the video, I think that Squid has better speed in the last meters than she had last week. The down is still not good, but at least she did it on the first try. We also worked on the recall from the square – finding the left side even when she has to run around my body and I’m moving away. We didn’t use the square, or even a down, to train this. Instead I sent her around a pole to get a new repetition. 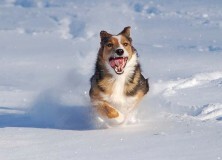 Fast, fun training! I’m working my way through the obedience exercises in Swedish class III. We tried recall with stand, and I’m very happy with Squid’s speed in both recall and stop. Unfortunately, I haven’t put enough work on the last part of the exercise – running to me after the stop. Squid expects her reward after the stop, since that’s what we’ve been doing mostly. Time to work on the whole exercise, without losing the perfect stop. It’s all about stimulus control really, Squid needs to get better at distinguishing between the recall cue and the reward marker. Fun training! The Switch Game – Great Foundation Skills! Chris and 12 month old GSD Devante have been working with us since this fall. Chris and Devante are training for IPO and I’m sure they’ll be superstars one day. I met them in Ohio in November and we started to work on tugging and some great games that will improve self control and lay a great foundation for retrieving and other exercises. Just look at how beautifully they master switching between two toys and how Devante is listening to Chris to understand if he’s supposed to run and get the toy on the ground or keep working with the one in the hand. This is a great foundation for IPO and obedience. Games like these also create a dog that is open minded, listening to his handler and engages in whatever his handler tells him to do. Chris and Devante are participating in our online retrieve month, and I’m very excited to work on a more formal retrieve with a dog that has this great foundation. Today’s obedience session was on Squids biggest distraction in her down stay – the sound of an agility tunnel. We came back home yesterday. It had started to snow when we came to Sweden on Monday, but we still managed to get home before the chaos started. It’s been snowing a lot today and traffic is just crazy in many places. Yo want to stay home if you can. I don’t look forward to a 5 hour (under normal conditions) drive south on Friday, but hopefully the worst is over by then. The handlers sit their dogs next to each other with 5 meters in between and leave walking 20 meters, where they stay visible to and facing the dog. The dogs shall sit for 1 minute without moving. Before the handler leaves the dog he is allowed to use the command “stay”. The handlers return to their dogs at the same time, on the ring stewards command. Squid and I haven’t really trained the sit stay for this exercise, but I think that she’s got a good understanding of that “sit” means don’t move you’re feet until I tell you to. My first test today was to see how long she would sit for if I just left her and did nothing. Distractions can be challenging, but the biggest distraction is often to do nothing and just wait. I thought that Squid would lie down after a whole, and I decided to use a timer and note how long she would sit for. I expected her to fail, but I also decided that I would reward if she didn’t move her feet in two minutes (it was really cold, so not the time for marathon sit stays). She sat very nicely for two minutes, so I got to reward. Nice to see that her understanding of “sit” is strong. Next session was on distractions. We did get Squid to fail once here. I don’t think there are many appetizing distractions that would get her out of her sit (dogs running through tunnels close to her not included, that might take us a few more years to master), but she can decide to lie down if she feels uneasy. My training should therefore focus more on getting her to feel safe and happy around some pressure (like dogs very close to her, someone using a harsh voice near her etc.) rather than using thrown toys and food lures. I did get a question about the criteria for the sit stay. I’m satisfied as long as she doesn’t move her feet at all. She is allowed to move her head to look at a distraction (but I often find that she likes to stare at me when someone tries to distract her, she’s probably found it to be helpful). At the level that I plan to compete with Squid, I don’t think anyone would mind if she looked around as long as it isn’t much. If I feel like it, I don’t think it will be a problem to add criteria for her head later on. We’re dedicating the whole month of October to help you teach and perfect heelwork. 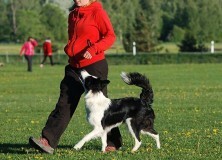 Heeling is a complex exercise that can be used for obedience, rally, canine freestyle and heelwork to music. 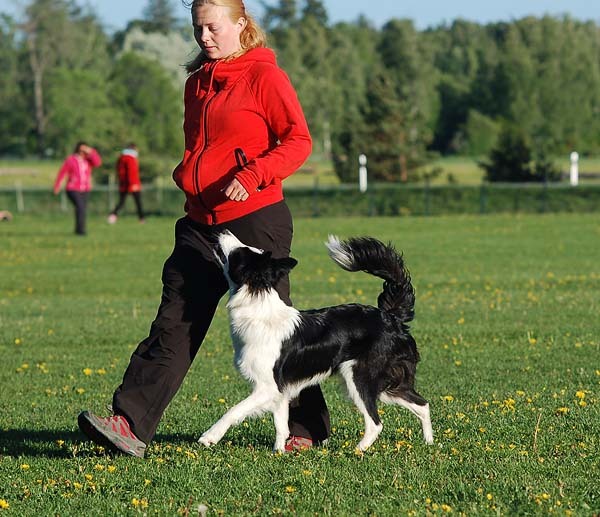 We cover all aspects of heeling in text and video in our October online workshop. If you want more than instructions, you can sign up for a working spot and send us as many videos as you like for an entire month. We will comment on your training and help you progress. Sign up here!